Home » Resources » Building Administrators » Too hot? Too cold? By design or by age, most of our facilities on campus do not have air conditioning and UBC has made recent significant changes to how we deliver heat to almost every building on campus. If you are new to your building, ask someone who has worked there for a few years if the temperature you are experiencing is normal. You might be experiencing the regular hiccups associated with warmer or cold weather or you may have identified a more serious issue. Are you feeling too hot or too cold? What is the temperature at the nearest thermostat? What type of space is affected? Are there any temperature sensitive research, equipment or specimens in this area? What if my heating issue isn’t the number one priority? Our facilities managers will work with your building administrator to ensure that nothing gets overlooked. Facilities managers take a personal interest in managing issues directly with senior leadership and our staff. To learn more about your building, or to find your relevant facilities manager, click here. Many buildings on the UBC campus, whether by design or by age use passive cooling through the air circulation system. Outdoor air enters the building’s supply fan at the ambient air temperature, the lowest temperature available. Solar radiation converts to heat energy when absorbed into surfaces. The less reﬂective the surface, the more heat is absorbed. Air is heated by occupants, solar radiation, mechanical and electrical systems, computers, lights, space fans, etc. 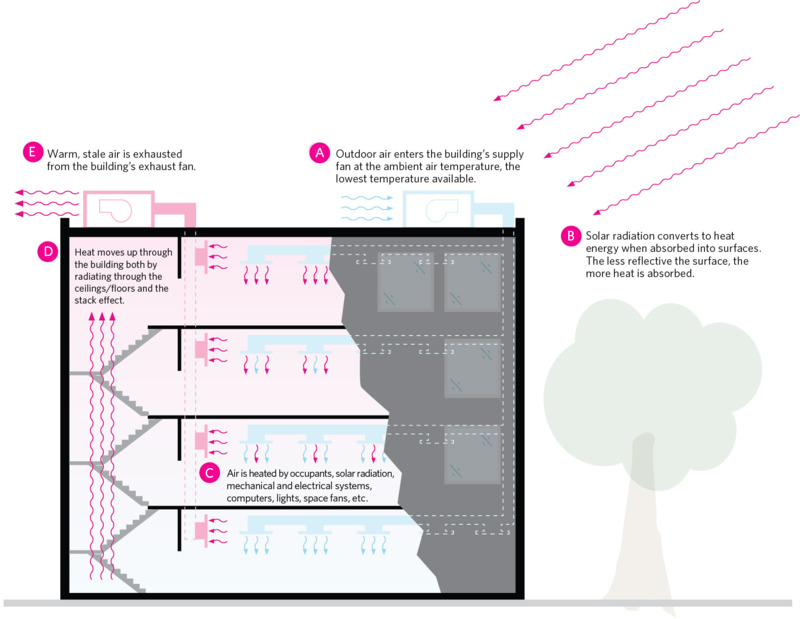 Heat moves up through the building both by radiating through the ceilings/ﬂoors and the stack effect. Warm, stale air is exhausted from the building’s exhaust fan. The buildings at UBC have been built, updated, retrofitted, and worked on across a century. Because of this it is very difficult to talk about a “typical building” and what can be considered ordinary. Each building has their own unique heating systems. For most core buildings, UBC’s Energy & Water Services Department operates a district energy system (DES) to distribute heat energy to most of our buildings. In these DES systems, heat is generated at a central site (the Campus Energy Centre and BRDF) and then distributed by hot water through a system of pipes to 130 buildings on campus, where devices called heat exchangers transfer the heat energy from the district hot water to the building hot water system. The building hot water is then circulated through the building to radiators and heating coils for heating or heating water that comes out of our hot water taps. In some cases where the building has limited economic life remaining, the buildings were not connected to the DES system and have a stand-alone steam generator, have the steam infrastructure removed and electric base board heaters and hot water tanks installed, or are running hot water through the steam infrastructure. These buildings are being decommissioned and replaced following UBC’s capital plan. What do we consider hot or cold anyway? How we feel temperature is very personal. Where you sit, what clothing wear—it can all change the way the number on thermostat feels to you. In general, UBC follows industry standards (ASHRAE Standard 55-2004) to keep our rooms between 20° and 27°. We target 21° when heating and 26° when cooling.